U.S. Gold, Going or Completely Gone? My primary field of research is focused on precious metals; namely, gold and silver, and I know that recent reports indicate that various countries are contemplating repatriating their sovereign gold reserves. Further, the U.S. Treasury and Federal Reserve have balked at GATA�s recent Freedom of Information [F.O.I] requests and demands for an independent, verifiable audit of the Sovereign U.S. Gold Reserve � thus a little bit of forensic investigation of U.S. gold exports was in order. I just needed to figure out how to access the relevant numbers. 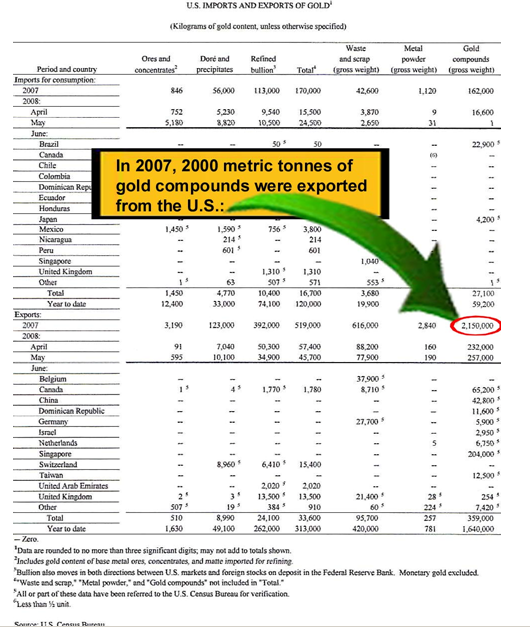 I took special note of how 2,920 metric tonnes of �Gold Compounds� had been exported from the U.S. in 2008. This number seemed BIGGER than BIG � because the U.S is only alleged to have stockpiles of sovereign gold of 8,100 metric tonnes while annual U.S. mine production of gold is roughly 228 metric tonnes. This figure of 2,920 metric tonnes is equal to 36 % of all alleged sovereign U.S. gold stocks or more than 14 times annual U.S. gold mine production. So, I was left wondering, �just what is/are �gold compounds�? I contacted the USGS and queried a qualified individual [who had working knowledge of this data stream] about the definition of �Gold Compounds�. I was told that, according to the U.S. Census Bureau � who supplies not only the definition but the actual reported numbers, gold compounds were typified by industrial type products containing low percentages/amounts of actual gold content � like gold paint. When confronted with reason, the individual for the USGS agreed that the data, as published, did not make logical sense and explained that the U.S. Census Bureau was questioned as to the veracity of this particular line item in their data. I asked the USGS employee if the gross weight or the gross value [not shown in the table but known to the USGS] of the �Gold Compounds� was queried. The individual confirmed that their query to the U.S. Census Bureau dealt with the gross value being assigned to these exported goods. I responded rhetorically, �being an issue of gross value � then let me guess that the U.S. Census Bureau is assigning an astronomically high value to these goods. Such a high value would be COMPLETELY INCONSISTENT with what the U.S. Census Bureau claims these items are- namely, industrial goods. The values being reported would be more in line with these goods being gold bullion or equivalents�. The individual from the USGS confirmed my reasoning when he responded, �that would be CORRECT�. Ladies and gentlemen, the foregoing data and discussion with the USGS individual is proof that the United States of America [or criminal elements within its Treasury and/or The Federal Reserve] �HAS� surreptitiously exported physical gold - and continues to do so. It is confirmed. The exports are likely coin melt [or gold compound, if you prefer] from the great gold confiscation back in 1933; or alternatively, this terminology is being used to disguise physical repatriation of foreign gold bullion formerly on deposit with the N.Y. Federal Reserve. Such repatriations are recorded as �exports� in U.S. Trade data. Public acknowledgement of same would scream like a siren call that the global financial community has totally lost faith in American financial stewardship � hence the need to do so on the sly. This is being done in a vain/desperate/losing battle to satiate �off the charts� global demand for physical gold bullion arising from the profligacy of the American Empire�s two previous Administrations and to prop up the failing U.S. Dollar. 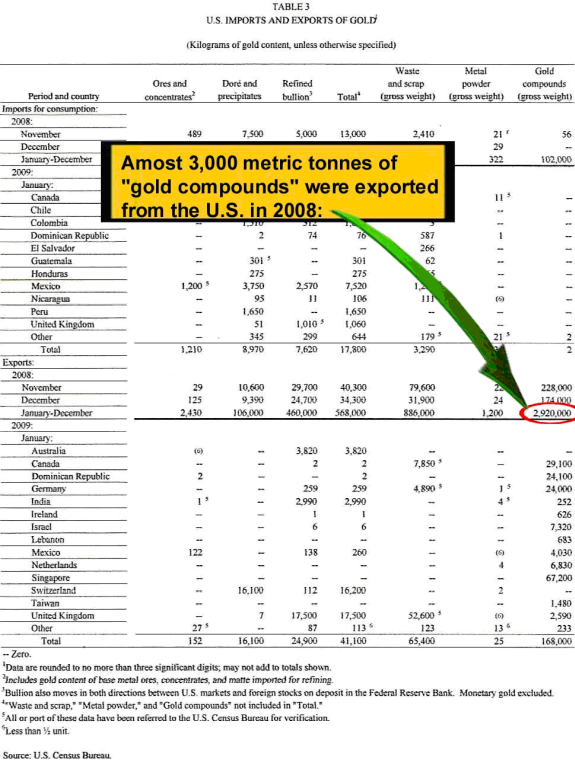 Over the course of 2007 / 2008 � more than 5,000 metric tonnes of �Gold Compounds� have been exported from the United States of America representing more than 62 % of reported sovereign U.S. gold reserves or about 24 times annual U.S. mine production. The fact that industry funded trade groups like the World Gold Council and other professional gold consultancies, who shall remain nameless, have not reported these facts negates their credibility and illuminates them as dupes or willing shills. These fraudulent or ignorant organizations deserve to be shuttered and disbanded. The value of these bullion exports significantly �skew� the doctored U.S. Trade numbers [coincidentally, also prepared by the U.S. Census Bureau] in an attempt to convey a picture that the U.S. financial position is improving. The reality is this, when gold exports are backed-out, the U.S. Trade picture is decidedly worse. The United States of America claims to possess a little more than 8,100 metric tonnes of sovereign gold stored principally at Fort Knox, Kentucky, West Point, N.Y., the Denver Mint and The New York Fed. The sovereign U.S. gold reserve has not been independently audited since the 1950�s during the Eisenhower Administration. GATA�s freedom of information requests are all about ensuring that the 8,100 metric tonnes of U.S. sovereign gold is still owned by the U.S. In April, 2008 the Federal Reserve responded to GATA�s request, releasing hundreds of pages of worthless information with significant portions redacted. They also claimed that they were withholding hundreds of additional pages of documents. The status of the withheld documents is currently under appeal. These stonewalling tactics � withholding details - are eerily similar to those employed by Messer�s Bernanke, Paulson and Geithner refusing to divulge frank details as to �who� the beneficial recipients were of TARP and TALF funds. No credible audit of the Sovereign U.S. Gold Reserve will EVER be allowed � because the gold is simply not there. Rob Kirby is proprietor of Kirbyanalytics.com and sales agent for Bullion Custodial Services. Subscribers to the Kirbyanalytics newsletter can look forward to a weekend publication analyzing many recent global geo-political events and more. Subscribe to Kirbyanalytics news letter here. Buy physical gold, silver or platinum bullion here.